David Luppino, owner of Just Ride Bicycles, has some announcements to share. about 30 days and is an inspiration to all of us to get out and ride. address it is only $11 each. Bicycle art that doubles as a place to lock your bike in Mt. Dora. Saturday afternoon in St. Petersburg reminded me of the Hub Grub Ride in Seminole Heights as the Trek Store of St. Pete launched the inaugural St. Pete Bike n' Eat ride -- a bicycle tour of six restaurants in the 'burg. Kudos to Rick and Anne Fidanzato, owners of the Trek Store of St. Petersburg and ABC Bicycles, for organizing a terrific bike event that drew about 85 bicyclists who pedaled the 12-mile route and enjoyed samples at a half-dozen local St. Pete restaurants. 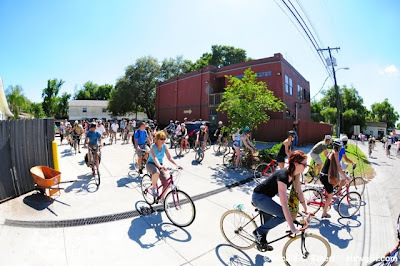 As the Hub Grub organizer, I know the time and effort it takes to pull off one of these rides -- lining up the restaurants, fashioning a safe bike route for casual bicyclists and creating an ambience that's enjoyable for newcomer and veteran bicyclist alike. Rick and Anne pulled it off like pros and I enjoyed a wonderful day of bicycling and restauranting in St. Pete this afternoon. Cool scene as people sign up for the Bike n' Eat. Biking to stop two -- 400 Beach. There were two bike events today in St. Pete, where the fixie bike messenger wannabes ignored all traffic laws, flew through red lights and turned left through a line of slower-moving cyclists because they're really cool and they were in some sort of treasure hunt contest. When drivers see fixie riders flaunt every traffic rule in the book, no wonder bicyclists get such a bad rep. Restaurant 2 -- We arrive at 400 Beach. Thank you Rick -- you did a great job. Dipping into the artichoke dip. Restaurant 3 -- Bicyclists swarm the Taco Bus. A great collector'stem -- the Taco Bus water bottle. Filled with pineapple juice. Restaurant 4 -- A few blocks from the Taco Bus is Grand Central Perc -- a neat coffee house. Left The Hangar and on to Harvey's on 4th Street North. Thank you to the thousands of you who contacted the director of your state transportation agency regarding last week’s action alert. Your voice has been heard loud and clear. 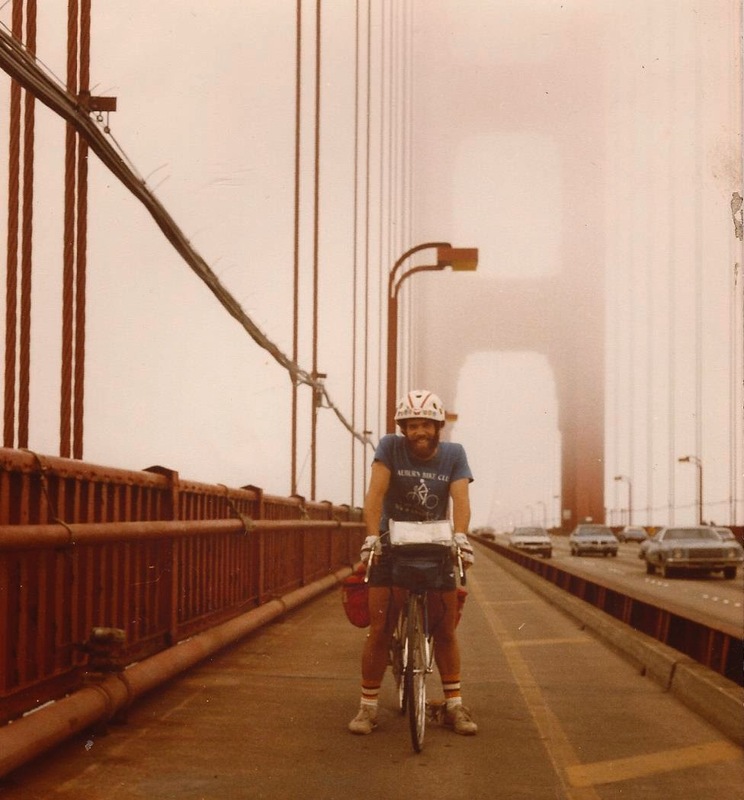 Due to your combined efforts, the American Association of State Highway and Transportation Officials (AASHTO) has withdrawn their recommendation to the Federal Highway Administration (FHWA) to weaken the requirements for states to give “due consideration” to the needs of bicyclists and pedestrians when constructing roadways. The League of American Bicyclists, the National Center for Biking and Walking, and America Bikes will be meeting with AASHTO officials next month to discuss this and other important issues. Why Is Killing A Bicyclist Criminal Negligence In Other States But Not Florida? 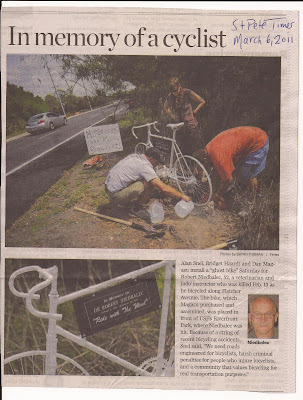 I bicycled past the Robert Niedbalec ghost bike early this morning and wondered why in Louisiana a driver runs down a bicyclist from behind and is charged with negligent homicide (see link below) while I'm unaware of any negligent homicide cases involving motorists who run down bicyclists in Florida. SWFBUD applauds the city of Tampa for its 40th Street road project, which includes a newly-poaved surface, bike lanes from Hillsborough to Fowler and three traffic circles that keep traffic flowing. In the early mornings, I bike from Seminole Heights east on Hanna Avenue and intersect a 40th Street circle, which takes me onto the road north to Busch and beyond. The road is smooth as silk and the bike lanes are great. The traffic circles don't have the bike lanes, but I flow into the inside lane and take the lane. Most motorists understand my right to the lane and follow me if they need to turn out of tyhe circle behind me. Well done, city of Tampa. Now, let's build some more roads like this around Tampa Bay. Kudos to Myron Griffin of Seminole Heights in Tampa who asked the city of Tampa to place sharrows on 12th Street -- a busy north-south road in the Seminole Heights neihborhood that is used by motorists and bicyclists alike because it's a straight shot from Sligh Avenue to Hanna Avenue without stop signs. The city of Tampa rejected Myron's request, but did say why. So, rather than give up -- which I assume the city of Tampa assumed when it rejected Myron's request -- Myron forged ahead with a follow-up letter. I have printed the letter below. We need people like Myron who will ask the city of Tampa to make our roads safer for bicyclists and pedestrians and will walk away when he gets the cold shoulder from local government. I received an email from City of Tampa that the request for sharrows had been closed. It was a bit unclear as to whether it was still under consideration or not, but after having several look at it, we concluded that it had been considered, but did not make the grade. May I ask for an explanation as to what criteria it did not meet? It's the least you could do for us. It is very frustrating to make nominations and have them considered, discussed, and dismissed without a word of explanation. We would appreciate this information so we may proceed in our own way to improve the safety of our valued bicyclists and pedestrians. Thank you and would you please copy your dept. head, (Jean Dorzback). I believe the city of Tampa is trying to create a policy regarding installing sharrows on streets that are not being re-surfaced. The city is also conducting a bike-ped study, which includes looking at three main areas in the city -- downtown, Westshore and the USF area. Great news for people who travel with their bicycles. Frontier Airlines will be removing its flat fee for bicycles. It often costs $75 to check a bicycle with many airlines. 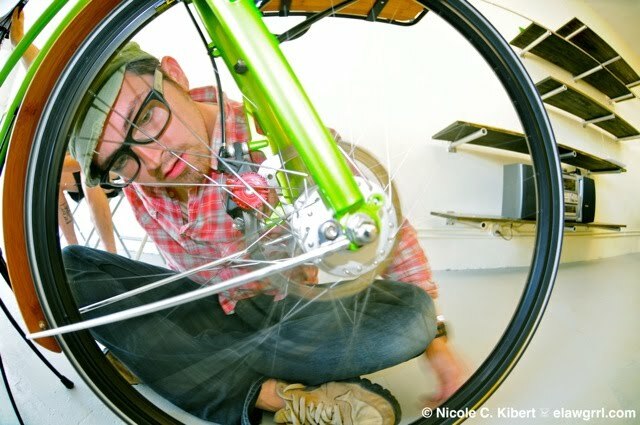 checked bags," Adventure Bicycling wrote in a report this week. I hope more airlines will follow Frontier Airlines, whyich is based in Denver and is used to flying a lot of people with bikes to Colorado. On Saturday mornings at the St. Petersburg farmers market you can find former St. Pete Mayor Rick Baker strumming his guitar at the market's weekly home in the parking lot of Al Lang Stadium. So this morning, St. Pete's ex-mayor wearing his trademark dungaree shorts ended a set and shifted over to a table topped with his new book, Seamless City. He was selling books and signing them at the market. I was in downtown St. Pete with my bicycle after cycling from Tampa over the Gandy with my bike pal Ellen and her friend Doug. Both are riding the Police Unity Tour this spring. I said hi to Rick Baker, who used to stop at the Bicycle Bash festival when SWFBUD staged it in his city. I noticed Rick was hanging with a pal -- new Tampa Mayor Bob Buckhorn, who was visiting Rick while his daughter was swimming at the North Shore Pool. And even St. Pete Mayor Bill Foster was there, too. Since I had an audiience with the two current mayors and Rick Baker, I took the chance to tell Rick that he deserved credit for transforming St. Pete from a Mean Streets city to one of the most bicycle-friendly cities in the state. Indeed, I spent Saturday morning biking from bike lane to trail to bike lane throughout St. Petersburg. Then I asked Rick to help Buckhorn make Tampa more bike-friendly and explained to Bob the importance of a network of interlocking bike lanes or paved trails through a city so that neighborhoods can be safely connected via bicycle and cyclists can get where they need to go in an efficient and safe manner. Rick said he mentioned the bicycle progress in St. Pete in his new book and Bob seemed to understand that bicycling needs to be valued in Tampa. Tampa city government seems a bit more receptive to making its roads better for bicyclists -- witness 40th Street north of Hillsborough Avenue and North Boulevard's new re-surfacing and bike lanes north of Cass. Coming soon after the city dragged its feet for years -- Bayshore Blvd. bike lanes as part of the re-surfacing project. But Tampa needs to be proactive and put sharrows and Share the Road signs on other roads used by bicyclists that do not have space for bike lanes. Too many studies and too many reports and too many powerpoints. 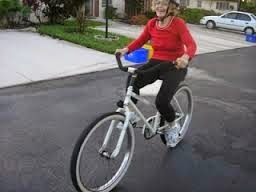 Notice to Tampa: stop spending money on consultants and start spending money on road improvements that help bicyclists. For years, the MPO has been advising Tampa on where bike lanes should go. The city already has maps of proposed bike lanes. Let's make it happen. It's not rocket science. Making a city more friendly for bicyclists is a matter of political will by a mayor and the can-do enthusiasm of city workers to make it happen. 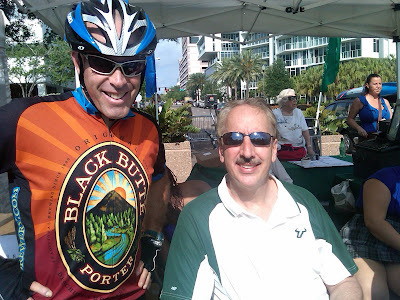 Let's hope Buckhorn takes a page from Baker's book and buys into making Tampa a better place for bicycling. On Friday, the American Association of State Highway and Transportation Officials (AASHTO) released a letter and supplemental document, which asked the US Department of Transportation to weaken their guidance on accommodating bicyclists and pedestrians. The supplemental document, submitted as part of a formal review of regulations, asks that the Federal Highway Administration (FHWA) withdraw their guidance on the meaning of “due consideration” of bicyclists and pedestrians to make it easier for states to ignore the needs of non-motorized travelers. AASHTO prefers the weaker “consider where appropriate” to allow states to avoid having to justify failure to accommodate bicycling and walking. This request is misguided. At a time when cities are building entire bicycling networks for the cost of one mile of urban four-lane freeway, bike projects are putting people to work, and benefiting business, this is not the time to move backwards. When more and more states – 23 and counting – are embracing Complete Streets policies, AASHTO should be a leading voice in shaping holistic and comprehensive transportation systems, not resisting them. In fact, AASHTO’s own 12 year-old Bicycle Guide, due to be up dated this year, says that bicyclists and pedestrians can be expected on any roadway they are legally allowed to operate and therefore should be accommodated. Jordan Miller, owner of the new Velo Champ bike shop in Seminole Heights, tells me that he will join SWFBUD to help bike advocacy in Tampa. Jordan's store will be among 12 bike stores in the Tampa Bay area that's part of SWFBUD. It's great news that Jordan's Velo Champ is joining SWFBUD. I'm happy to report that Jordan will be having a soft opening of his Velo Champ shop tonight at 7 PM. His store is located at 6112 N. Central Ave. next to New Way Cafe. See you there. 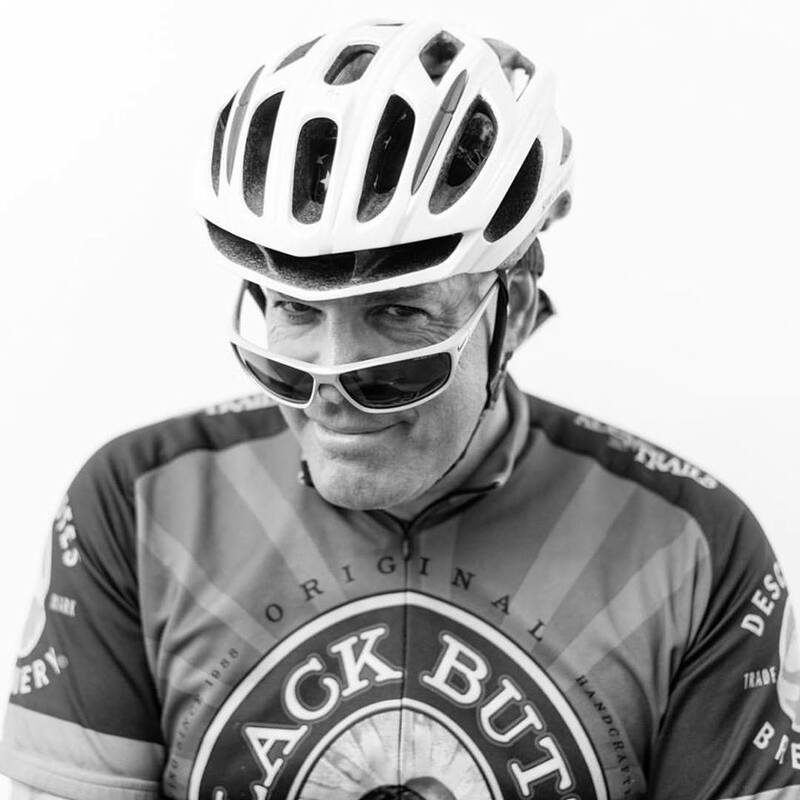 My name is Alan Snel, director of SWFBUD (South West Florida Bicycle United Dealers) -- a group of 12 Tampa Bay area bike shops that represents thousands of bicyclists in the Tampa Bay area. I am writing on behalf of our 12 bike shops and our thousands of bicycling customers to voice our support for the proposed Courtney Campbell Causeway trail project. This is a badly-needed trail project that is necessary for bicycle safety, transportation, commuting, recreation, safe access, tourism and economic development reasons. Bicycle safety -- the current high bridge on the causeway has a mere four feet for a shoulder, placing a bicyclist on the shoulder in danger of being struck and potentially killed. 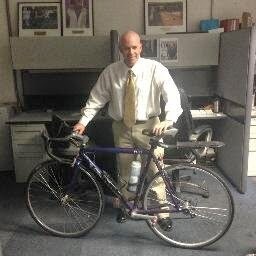 Too many bicyclists are being killed on local streets and roadsin Tampa Bay. Transportation and Commuting -- Bicyclists would use the causeway to reach jobs and other destinations in Tampa and Clearwater. It would help remove motorized vehicles off the road and improve traffic flow. Recreational and Access --The former Friendship Trailbridge drew 600,000 annual users, but that bike-ped bridge between Tampa and St. Petersburg is closed and a new bridge for bicyclists and pedestrians is needed to cross The Bay. This trail would provide safe access to recreational points along the causeway. Tourism and Economic Development -- Visitors to Tampa Bay and Florida express interest in locating a safe place for bicycling and the causeway trail would create economic opportunities and spending. Please move forward with this very vital trail project. Please write to the Florida DOT and tell them to build the Courtney Campbell Causeway Trail. When the old Gandy bridge was deemed unsafe and it was decided not repair it, the Tampabay Region lost a great asset. By building a safe route to cross Tampa Bay it would fill the missing link for a continuous bike/ped path around the our whole region. This would attract families and business to the area as it has done in other metropolitan areas. The Greater Tampa Bay area needs the Courtney Campbell Causeway Trail! I urge you, to press forward with its' implementation and completion. Thank you for you time and consideration in this important matter. SWFBUD is a member of the Hillsborough County Bicycle Pedestrian Advisory Committee and our committee doesn't get too many people off the street attending our meetings. But at yesterday's meeting, our BPAC meeting was honored to receive a visit from the grandfather of the walk-bike movement in Florida -- Dan Burden. 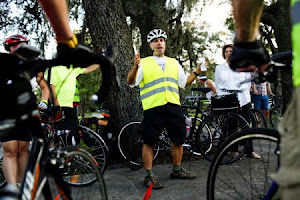 For those who don't know Dan, he successfully lobbied for and gave birth to the bicycle-pedestrian committees around Florida and is a tireless and respected voice for bicycling, walking, hiking and trails in the Sunshine State. It was great to see Dan yesterday in Tampa! Mark your calendar for a great bike event on April 23 at 3 PM. 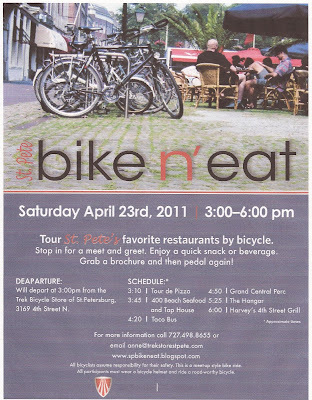 A restaurant bike tour called the bike n' eat is being held by the Trek Bicycle Store on 4th Street in St. Pete. The SWFBUD store is owned by Rick Fidanzato and I'll be there at a SWFBUD table at the shop. SWFBUD asks you to write to these emails at the Florida DOT and tell them you support the proposed Courtney Campbell Causeway multi-use bike/ped trail. Many people are writing to oppose this vital project. Bicyclist Glen Gulickson, who works part-time at SWFBUD member store Bicycle Outfitters in Seminole, wrote this email in favor of the causeway trail. Aas a follow up to my email yesterday, I would like to submit the article attached below. It is the word for word presentation, before Congress, by John Burke, CEO of TREK Bicycle Corporation. You can take what you will from the article, but there are two things I would like to point out. Which is why when I bike I try and make eye contact or motion my arms for every motorist I can see or hear. I wave, give them a fist pump and flash a peace sign. I want every motorist to see me as a human being -- not a lifeless figure on a bicycle. If there's no traffic coming at me in an opposing lane, I wave motorists around me. If there traffic in the oncoming lane, I assume my traffic lane and then wave the motorist around me when the coast is clear. Most motorists appreciate the hand signals and connections. Many motorists wave or offer a thumbs up. We have a long way to go to get motorists to understand that a bicycle is a vehicle with a legal right to the road and that they're required to pass a bicyclist by a minimum berth of three feet. But mutual courtesy goes a long way in staying safe on the roads of Tampa Bay. It tales such a long time, but slowly and gradually we're seeing roads with bike lanes in the Tampa area -- Nebraska Avenue, 40th Street, North Boulevard, for example. And here's North Dale Mabry Highway north of Hillsborough Avenue. I hear Bayshore Blvd. in Tampa is next. Can't happen fast enough. Another week, another killed bicyclist at the hands of a killer motorist in the Tampa Bay area. This time, it was in Spring Hill at around 3:15 PM today when a pickup truck struck a bicyclist from behind in the shoulder of US 19 and dragged the cyclist before the motorist drove away and left a mortally wounded bicyclist on this side of the road. We gave seen safety programs discuss what bicyclists should do in Tampa Bay but how about a campaign telling motorists to stop killing bicyclists? It's nice to see the city of Tampa working on North Boulevard with a newly-paved surface and a new bike lane from Cass to the North Blvd Bridge at Blake High School. North of the bridge the roadwork will continue as the road gets narrowed from four to three lanes with bike lanes or sharrows to MLK Blvd. 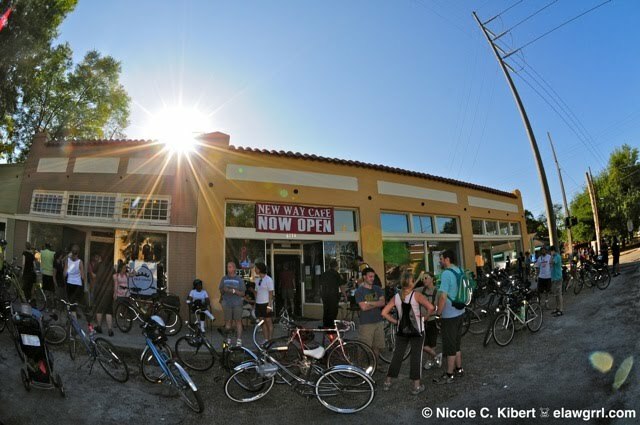 SWFBUD's 12 member bicycle shops are all great bike stores and they're always involved in new projects and events. At Carrollwood Bicycle Emporium -- a SWFBUD founding bike shop member -- owner Brian Eckman just unveiled a bigger store by moving next-door to a larger space. Here's Brian at his new place. 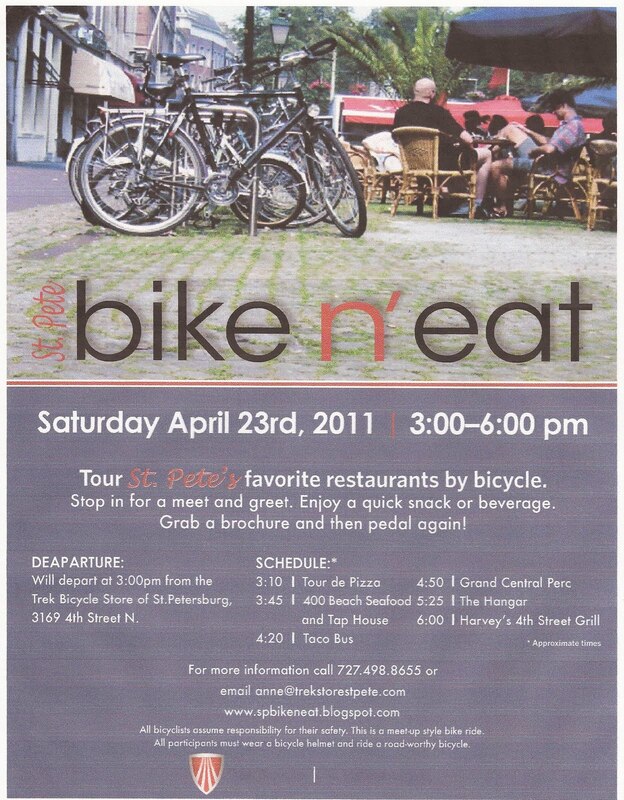 And in St. Petersburg, Rick Fidanzato, owner of SWFBUD bike shops ABC Bicycles and the Trek Store of St. Petersburg, is doing a Hub Grub-style restaurant bicycle tour called, "St. Pete Bike n' eat," on April 23. The bike n eat event starts at 3 PM from the Trek store at 3169 4th Street N. in St. Petersburg and will include stops at Tour de Pizza, 400 Beach Seafood and Top House, the Taco Bus, Grand Central Perc, The Hangar and Harvey's 4th Street Grill. I met some wonderful new folks at the Hub Grub Ride Saturday, including Nicole who rode a terrific green civia bike and took some gorgeous photos that she posted on her suburbanapologist.com web site. These three photos are posted here with Nicole's permission. Saturday's gorgeous sunny and warm afternoon was the setting for another Hub Grub Bicyle Ride of Seminole Heights as 100 bicyclists took to the streets of Seminole Heights and turned the Tampa neighborhood into Portland for the day. Thank you to our host restaurant, Ella's, and other partipating restaurants and businesses -- The Refinery, Cleanse Apothecary, Nani's, Publix, Viitals, New Way Cafe and Velo Champ. Tampa Police were amazing as usual -- keeping the ride safe as officers on bikes excorted us along the 7-mile route. They also handled a cursing drunk motorist at the Central/Hanna light and couple pot smokers in a car along Lake Roberta. I loved the diversity of the bicyclists, ranging from baby Kalina and a 5-year-old on a small bike to veterans like Lynn and Don. The vibe of the ride showed the Hub Grub is much more than a bike ride -- it's grown into a full-fledged community event. SeminoleHeights Patch did a great story on the Hub Grub. I enjoyed the bicyclists' equipment, the bikes and, of course, the wonderful people and bicyclists of the Hub Grub. 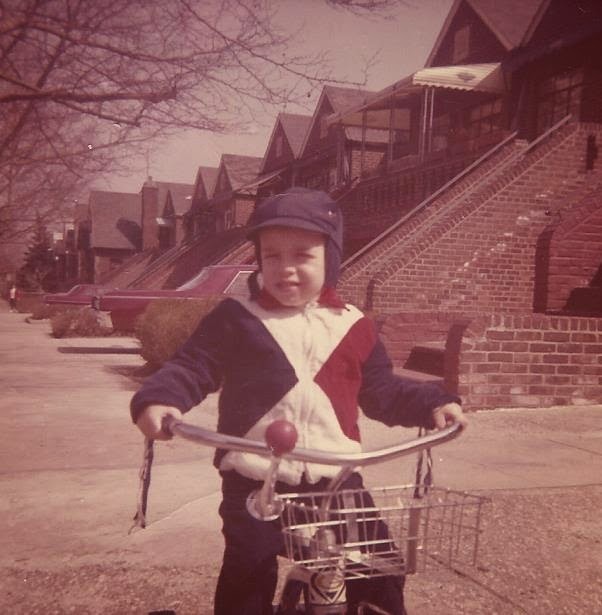 Here's one example -- one of my favorite bike helmets. Tampa Police Cpl. Eddie Croissant, a TPD bicycle specialist, talks safety with the Hub Grub crowd. New Councilwoman Yolie Capin addresses the Hub Grubbers at Ella's -- our starting and end point. On the road to the Refinery and Cleanse Apothecary on Florida Avenue. That handlebar is all bull. Hub Grubbers included former Councilwoman Linda Saul-Sena at the Cleanse Apothecary. Valerie of Publix (next to Nani's) dishes out apples and granola bar pieces. Hub Grubbers enjoy the spread at Nani's. Cpl. Eddie and one of our Hub Grub elegant riders. Bridget and Jared chat at Nani's. Bridget leads the crowd around Lake Roberta. Bicyclists ring Lake Roberta -- and pass the pot car. Thank you Ivan at Viitals bakery. On the way to New Way Cafe and Velo Champ. Jordan Miller, owner of Velo Champ (SWFBUD's newest store), addresses the crowd. Great crowd at New Way Cafe and Velo Champ. Thank you Florida DOT, which provided safety bracelets. New Way Cafe was a kind host and gave us a great food spread. There's Steve, owner of New Way Cafe. One of my favorite bike jerseys on the ride. The Hub Grub menu at Ella's. The Hub Grub DOT safety bracelets. That's Tammie in the middle at Ella's. End of the line at Ella's.